Babbling Brooke: What is a 'Vintage' Zoya? I'm using the word 'vintage' very losely here, but I want to show you something I picked up that I was SO EXCITED about!! Zoya recently posted about the Zoya Evolution, showing the original bottle, the mid-life bottle, and the current bottle (which is the one we recognize and love). I had never seen the original bottle before, so I was shocked when I was out yardsaling this weekend and came across not one but TWO! Of course I snatched them up to share with you, as well as a new bottle of Zoya (at $3, it was a pretty good deal). You guys know how much I LOVE polish history and I'm kind of a 'vintage' OPI addict - now I have two 'vintage' Zoya polishes in my collection too!! So fun! I'm still wearing Jitterbug, but today I painted my neighbor (and favorite nine year old), Gabriella's nails with The Face Shop Nail talk, which I won back in February from Jacy. 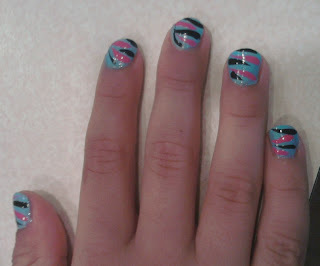 Next I painted pink and black stripes on her nails to resemble zebra stripes. Now she has an awesome last day of school mani (and matching pedi)! And Wan just posted this ADORABLE mani that makes me soo happy. Check it out HERE! Hope you had a great Tuesday!! I will say this in the nicest way possible....those old bottles are the u..g..l..y! lol I love the newer bottles. Cute colors though. I've never seen the old style. How fun! What's up with the gold caps. It seems like every old polish bottle had some gold in it. Makes them look so old and grandma-y. I've never seen them before so it's cool to see. Andrea, you make me laugh. The old bottles certainly see right out of their time ear! I love the new bottles too - so chic!! Arrianne, hahaha, I've thought that before too! What's up with the gold? I guess it was cool back in the day... I don't remember thinking it was dated (and I have many a photo of me wearing loads of gold jewelry - big gold hoop earrings, gold bangles, ekks!). The new bottles are certainly an improvement!! Cute nails!! I love looking/thinking about my old stuff and seeing how much of the "vintage" stuff I had (once upon a time). These oldies look so much fun :-D It's so awesome to see a brand develop over time!